I am a sucker for first dances at weddings. I get choked up watching these milestone moments at every single wedding. Songs are so tied to our emotions. 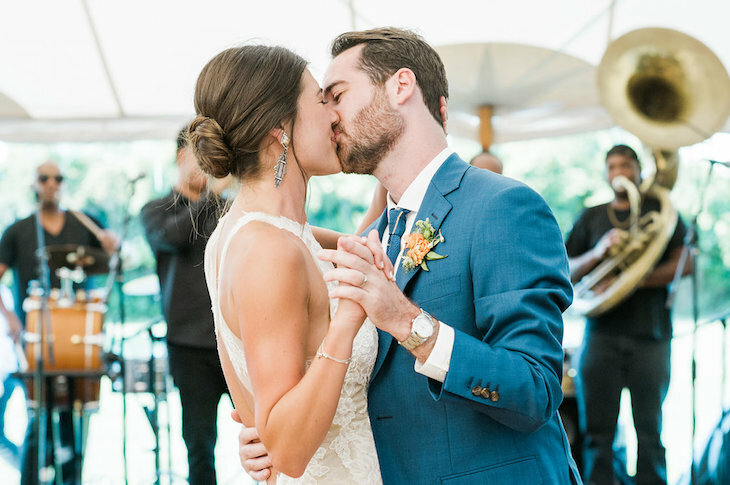 It is hard to give specific suggestions on wedding first dance songs, father-daughter songs, or mother-son songs but I am going to give some any way! For starters, my first dance song with my husband was “The Luckiest” by Ben Folds. When we were dating, Lucas would make me mix cds. At the time (circa 2001), that was OUR song. We felt like the luckiest people in the world to have met. When it came time to pick our first dance song in 2010, that made the most sense. It was sentimental and sweet and “us”. Since becoming a mother to a little boy, I have to say that the mother-son songs get me good. I can imagine the day when I will be dancing with my son. At that time he will probably be taller than me. I daydream about what I will say to him and how happy he will be that day as he becomes a husband. As my mind starts to wander about first dance songs, here are some contenders I have come up with. I imagine this song as my constant maternal reminder to my son that when life gets hard and marriage feels like work to remember days like this. “When you don’t need to worry there’ll be days like this” I hope he will always look back on his wedding day as one of the best days of his life. I danced to this song with my dad at my wedding and I love the idea of passing our first dance on. Even though I know he will now have his spouse to stand by him, unfortunately he can’t get rid of me. Have you ever seen the series Parenthood? It is one of my all time favorite shows and I devoured it when I was pregnant. This song is in the opening and I absolutely love the sentiments. Bob Dylan’s version is the classic, but I also love Norah Jones’s rendition. In the same vein as Stand by Me, my husband danced with his mom to Here Comes the Sun by Nina Simone as did his brothers. I love family traditions so this may become another favorite. The best advice is to go with a song regardless of whether or not it fits the mold. Choose a song that gives you a goosebumps. Engagement season is upon us. You are not seeing things. You will probably be setting an uptick of friends and family (and maybe you) with a newly minted ring on their finger. We mark engagement season from late November to February. In my opinion, the coziest and most romantic time of the year. 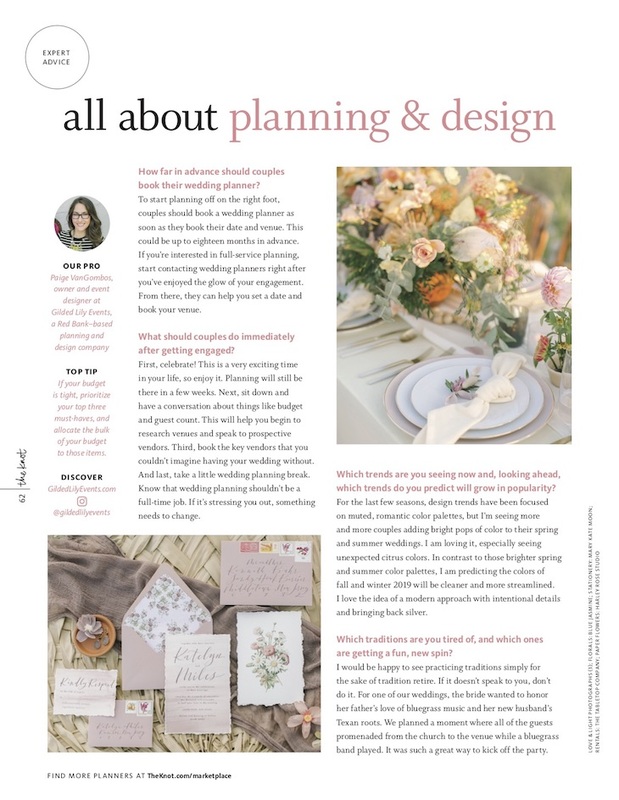 The Knot Magazine recently interviewed me for their Spring/Summer NJ edition Expert Advice which will be the time when most of these newly engagement couples will be saying “I do”. A few of my answers are in the magazine, but I thought many of the answers might be helpful to you, the newly engaged, so here you go! Pull up a chair. How many months in advance should a couple book a wedding planner to ensure they get the one they want? I think they should book a wedding planner as soon as they book their date and venue so the planning starts off on the right foot. This may be a year to a year and a half in advance. 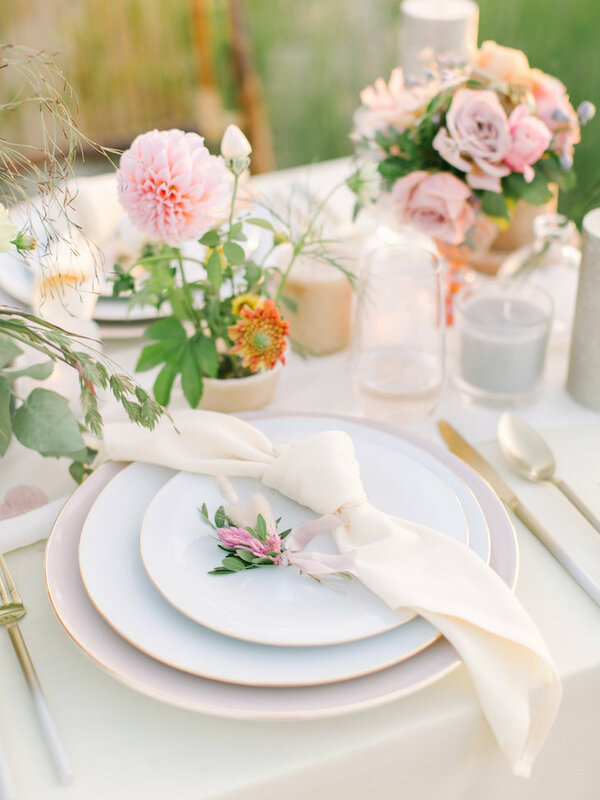 If you are interested in full planning, then start to contact wedding planners after you have enjoyed the glow of your engagement so they can help you set a date and book your venue. Most couples have likely never planned a wedding before. What are the common mistakes or myths about the process? 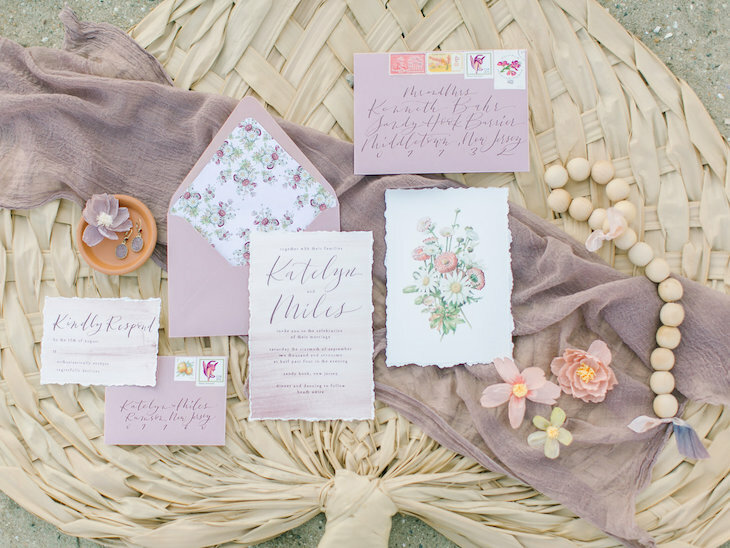 I think one of the common myths is that wedding planning is supposed to be overwhelming and stressful. If it is stressing you out, then something needs to change. Delegate more, look into hiring a planner or prioritize what is most important. I also think that many couples think that a wedding planner is not for them or it will be out of their budget. Yet what what you might spend monetarily, you will gain in time and sanity. What are the first three things couples should do immediately after getting engaged? • Celebrate! This is a very exciting time in your life so take some time to enjoy it. The wedding planning will still be there in a few weeks. • Sit down and have a conversation about budget and guest count. This will help you as you start to research venues and speak to prospective vendors. • Book your key vendors that you couldn’t imagine having your wedding without and then take a little wedding planning break. 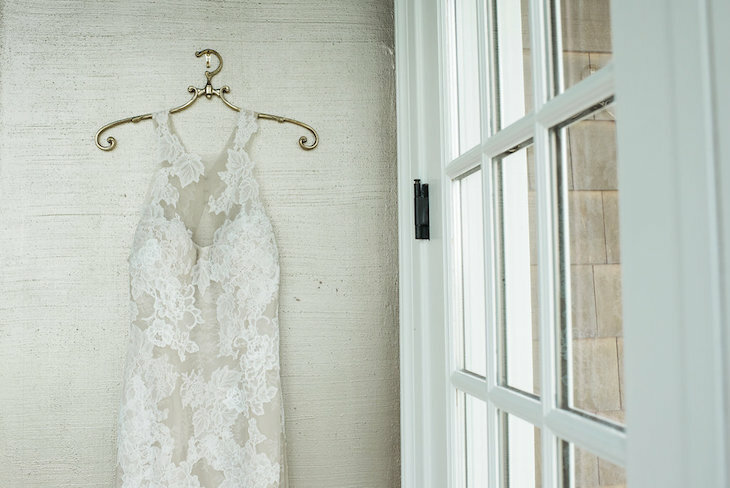 What traditions or etiquette would you to like to see retire when it comes to weddings? I would be happy to see traditions for the sake of tradition retire. I think if it doesn’t speak to you, don’t do it! Favors are a good example of this. I always tell my couples that guests are not interested in a favor for the sake of a favor. However if there is something really special about your relationship (like a mix of your favorite songs or a cupcake that you shared on your first date) that you would like to give to your guests as a thank you, do it. If not, don’t feel the pressure. Describe a recent example of how you’ve put an inventive twist on an old tradition. Your guests need to get from point A to point B so why not make it fun. For one of our weddings, the bride wanted to honor her father’s love for bluegrass and her new husband’s roots in Texas so we created a moment where all the guests promenaded from the church to the venue while a bluegrass band played. It was such a great way to kick off the party! If couples are on a budget, what vendors or add-ons do you recommend cutting? My best advice is to prioritize your top 3 “must haves” and allocate the bulk of your budget to those areas. If you are on a budget, you might just have to cut some of the details that are not that important to you. Think about the “long lasting” effects. 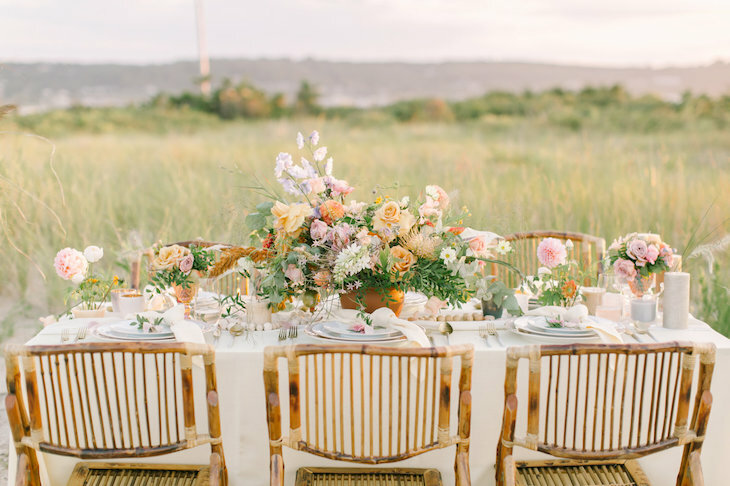 Guests will probably not notice (or care) if you skip favors, or ceremony programs so do not fret if every single detail doesn’t make the cut. Your guests are there to witness your love for each other and have a good time. 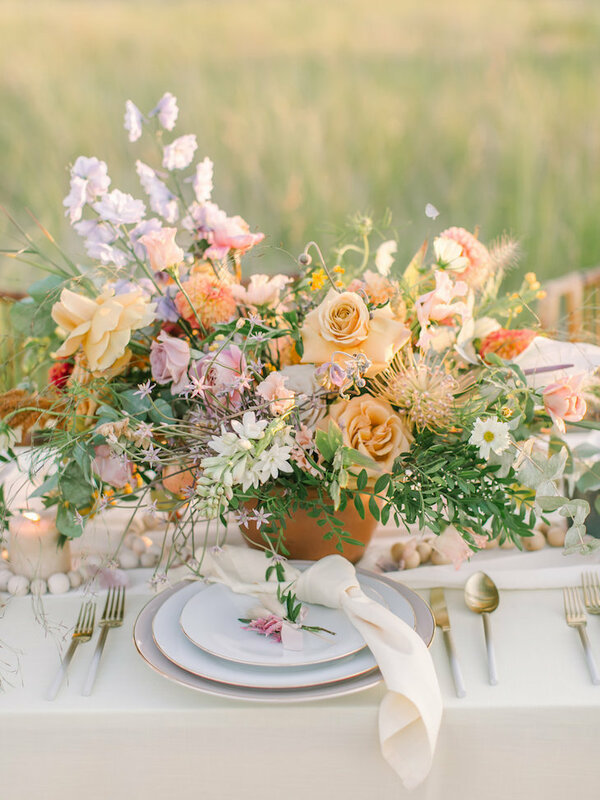 Looking ahead to Spring/Summer 2019, what wedding design trends are you seeing? 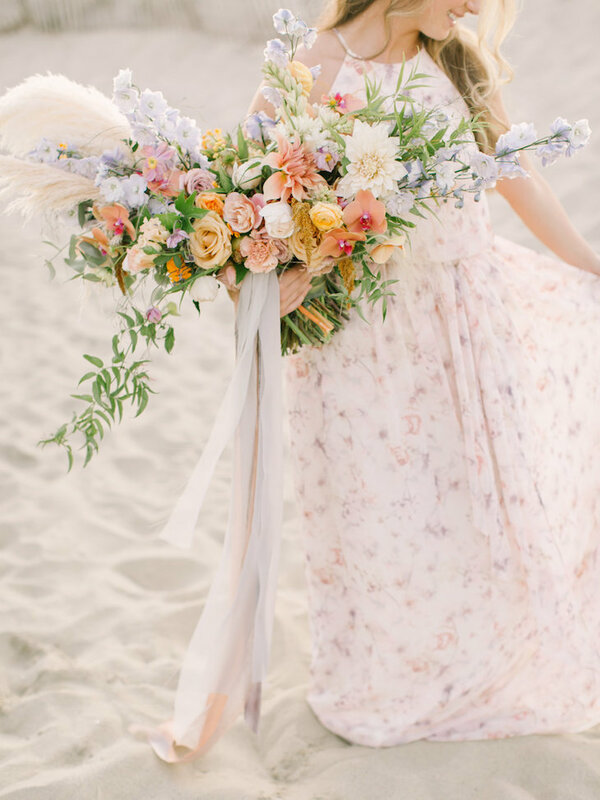 The trend for the last few seasons has been focused on a muted romantic wedding palette, but I am seeing more and more couples adding color for their Spring and Summer weddings. I am loving it especially unexpected citrus colors. 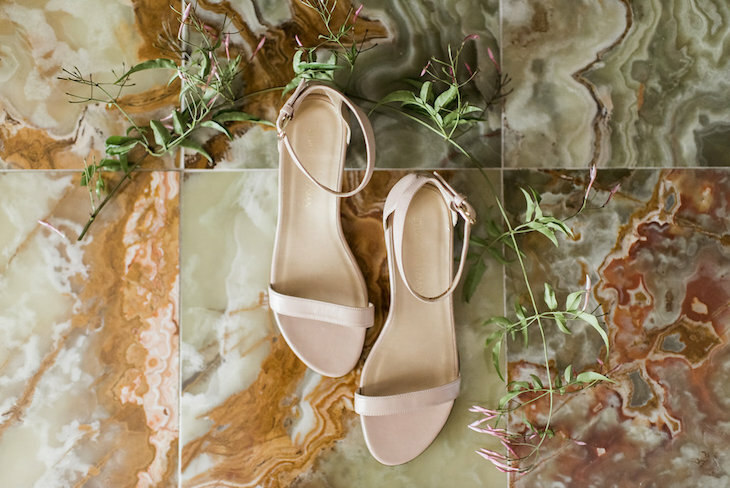 Looking even further ahead to Fall/Winter 2019, what design trends are you predicting? In contrast to the bright color palettes of the spring and summer, I am predicting that fall and winter 2019 will be clean and streamlined. I love the idea of a more modern approach with intentional details and bringing back silver! 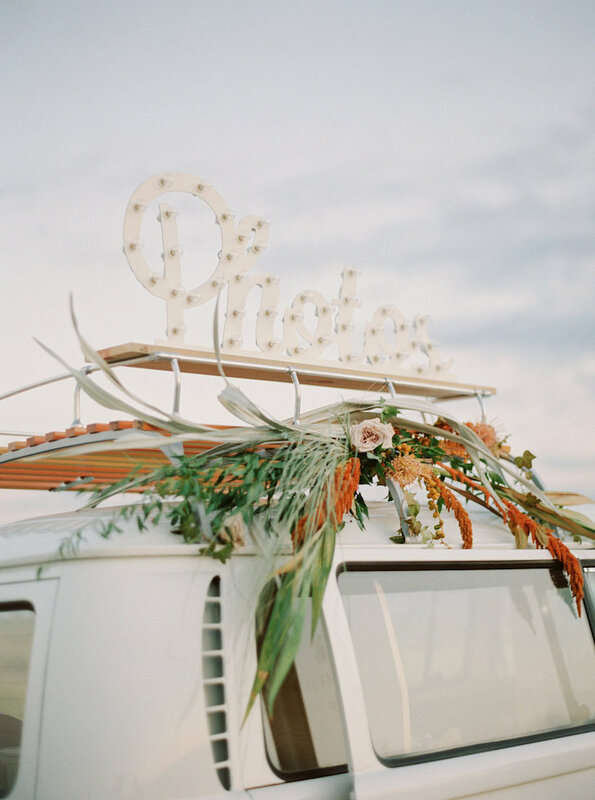 What’s a detail you’ve always wanted to design/incorporate into a wedding but haven’t gotten the chance to yet? It might sound unusual, but I have been inspired by children’s books lately. I would love to design a wedding with a nod to the whimsicality of storybook illustrations in a sophisticated way. 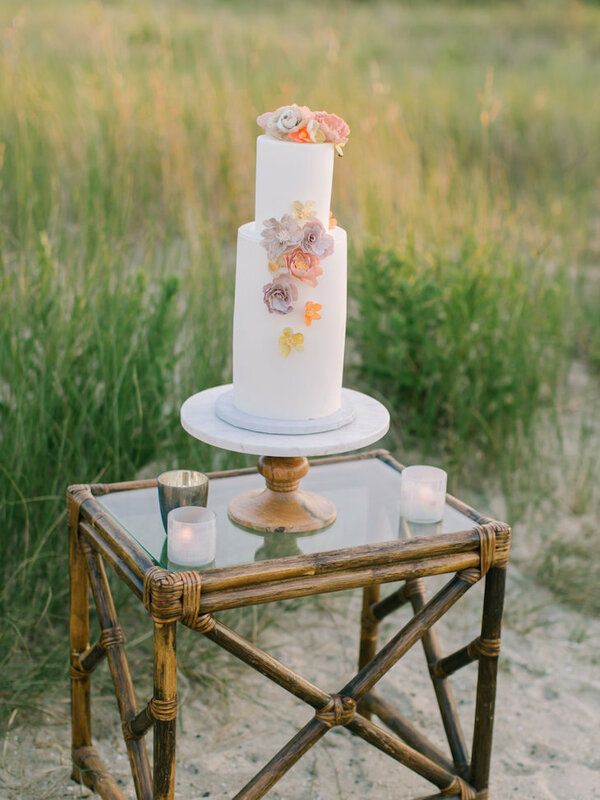 Share three pro tips you’d like all couples to know about wedding planning/design. • Wedding planning shouldn’t be a full time job for a bride or groom. Make sure you enjoy this phase of your engagement. • Put yourselves first. I know that it is hard to not listen to advice of friends and family, but do what makes you happy and reflective of your relationship. • Do not sweat the small stuff. Just about every wedding has a small hiccup or two, but it is how you deal with it that makes the difference. Rentals The Tabletop Company and Party Rental Ltd.